You have succeeded on creating OpenStreetMap account and you’re eligible to edit OpenStreetMap. Now we will learn how to add your data and edit it using an editor that runs in the browser called the iD Editor. 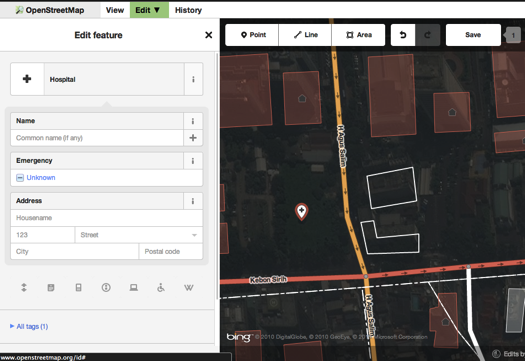 iD Editor is a web based OpenStreetMap editor that allows you to add and make changes to the OpenStreetMap data easily and fast by using spatial data sources such as satelite imagerY, GPS, and FiledPapers. Before you start, your computer must be connected to the internet. 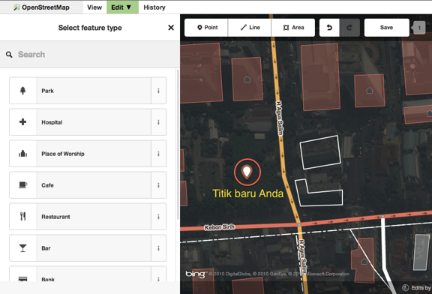 Open your browser, then go to OpenStreetMap website http://www.openstreetmap.org , log in to your account and zoom in to the area that you want to edit until the Edit menu is active. Click on the arrow sign next to the Edit ‣ Edit with iD (in-browser editor) as shown in the figure below. The figure below shows the main features of the iD editor. 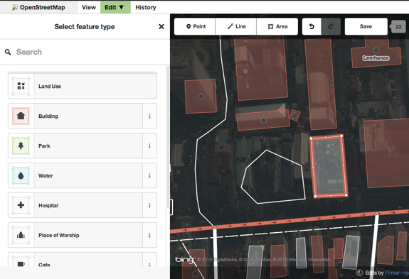 Feature Panel: This panel will show the attributes of an object selected from the map. You can add and edit attribute data from this panel. Information panel: At the very bottom of the image area, this panel shows some information such as those who have contributed map edits in this area, as well as attribution for imagery sources and other map data. There are 3 brightness you can choose: 100%, 50%, and 0%. Try all of them to see the difference. 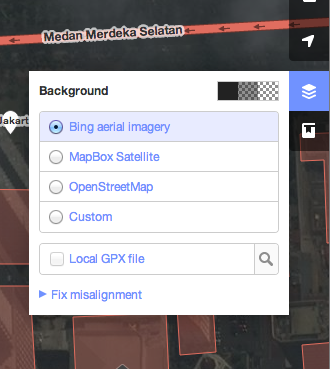 You can also set the provider of satellite imagery depending on which one is available for your desired area (the standard choice is Bing Aerial Imagery). 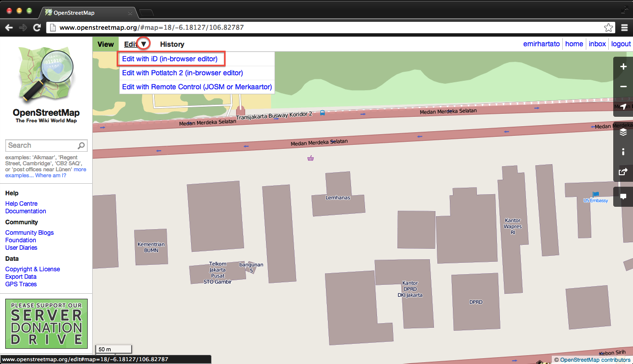 You can also set OpenStreetMap map as your background. You can add your GPS tracks and waypoints that are saved on your computer (they must be in GPX file format). Just click on your GPX, hold, and drag it to the editor page. to bring the imagery back to the initial position. Before we start practicing using iD Editor, first navigate to the desired area on the map that you want to edit. You can pan around the map by clicking on your mouse and dragging the map to your area of interest. You will see the cursor change into a plus sign (+). Now, click on the object that you want to map. For example, you see a building on the map and you know that building is a hospital. Click on the building. Now, you can see there’s a new point. At the same time, the feature panel will be showing you attributes that you can choose depending on the object type. 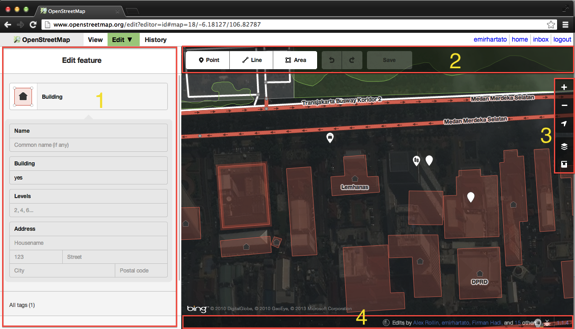 Now type Hospital on the Search section, and choose Hospital to add this feature to the map, as shown in the figure below. The point symbol will change automatically, and the feature panel will change into a form which can be filled with information about the hospital, such as the name of the hospital, the address, and other information about this feature. Features may have a different forms - points, lines, or polygons. It will depends on the type of the feature, the mapping scale, and the quality of imagery. If you want to move the location of that point, you can click on the object then hold it and move it to the new location. If you want to delete the object, click on the object, a delete button will show up. Click on that button to delete the object. And again you will see the cursor change into a plus sign (+). Suppose you want to draw a road. 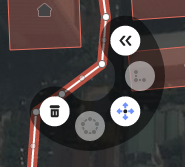 To do this, first click at one of the ends of the road, then just move your cursor to and keep clicking along the way of the roads and follow it until a road line formed. Double click to end the line and the feature panel will appear again on the left side of the window. Separating a point that is attached to other object. Again the cursor will change to a plus sign (+). Using the imagery as a guide, trace the area by clicking on the corners of the feature, as shown in the figure below. As with point and line features, when you click on one of the point on the polygon, you will see additional editing functionality. Similarly, clicking on the line of the polygon (between points) will reveal additional editing operations available to you. Fill in the Comment column with a brief note about the changes made in that area so that other users can note your edits. Then click Save. 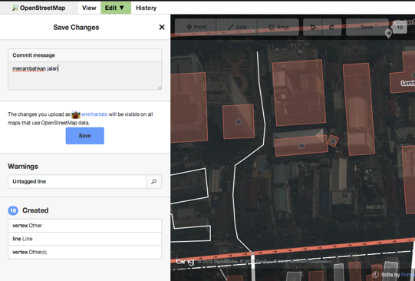 You should now be able to add your data to OpenStreetMap using the in-browser iD Editor. 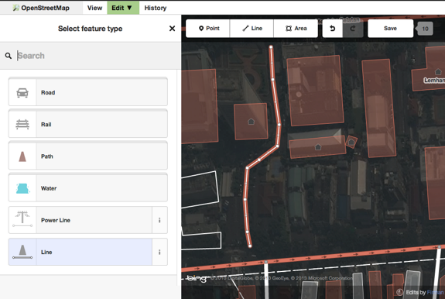 You also learned how to digitize the 3 types of objects in OpenStreetMap: points, lines, and areas (polygons). In the next chapter, we will learn about another editor, the Java OpenStreetMap editor, or JOSM as it is popularly known.